Postman Pat is becoming a favourite in our household and why not? It is something I remember my brother loving when he was young and it is always on in our house. Lucas has taken to meandering round the house with the post so I thought I would attempt to make a a homemade, cardboard postbox. It’s a so easy and quick to make and you can adapt it easily but also great activity for pre-schoolers, it really has kept him entertained. We had a cardboard box that I taped up and cut a slot in the front for the post. The box already had a flap in the side so I kept this open and widened the inside of the box to make it easier for Lucas to get the letters out. I painted the whole thing red and added some details after saving a picture of a postbox on my phone! I had saved some envelopes from a recent birthday and I put some card inside to make them sturdy enough for Lucas to handle. I popped these on top of the postbox to see if he would spot them. At first I was most disappointed when Lucas didn’t show much interest but one he realised he could put the letters (and other items) in and out he played quite happily. Once he had posted all the letters he peered hopefully into the box and was thrilled when I opened the side up and he could get them out. At one point he all but climbed in the postbox to retrieve the letters! I’m hoping to make some parcels with brown parcel paper and string to add to the collection of letters. This is a lovely activity to do with a toddler and it can link to so many other things, counting letters, mark making on envelopes and we are also going to post a real letter to ourselves so it will arrive through our letterbox! We will also be on the lookout for The Jolly Postman by Janet & Allan Ahlberg; I remember this from when I was at school and the book has little envelopes and letters in it, it is lovely. A great read and an engaging book for children. 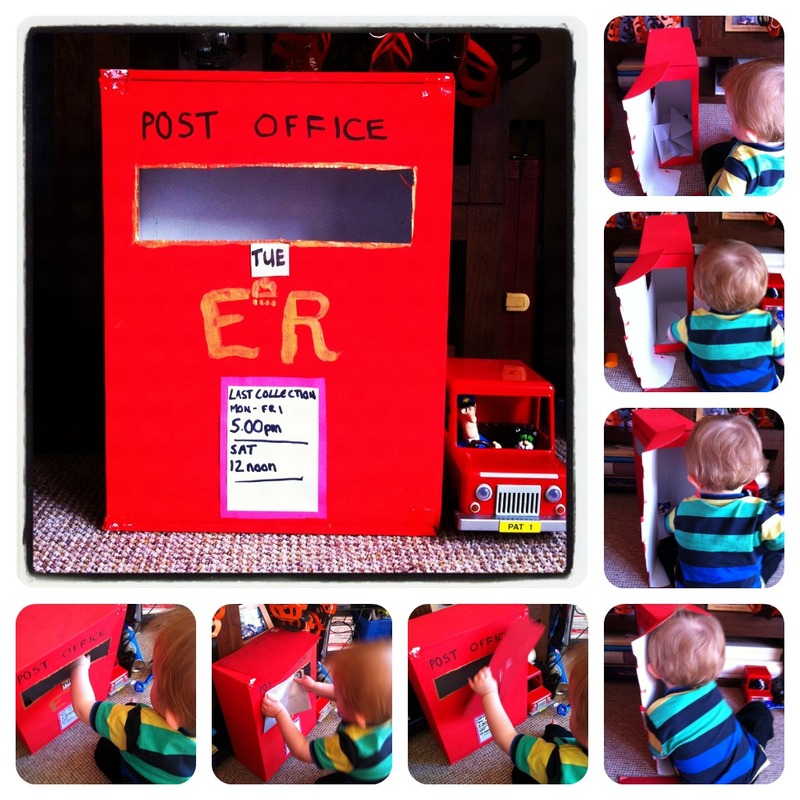 Here are some photos of Lucas enjoying the postbox and pretending to be Postman Pat!